Sompting Abbotts is a West Sussex independent school near Steyning, Worthing, Brighton. Excellent scholarship results and 30 acres of beautiful grounds. Historic Sussex private school reminiscent of Hogwarts that offers children a magical childhood and outstanding educational results. Sompting Abbotts Preparatory School is a West Sussex private school within easy reach of Worthing, Steyning and Brighton. 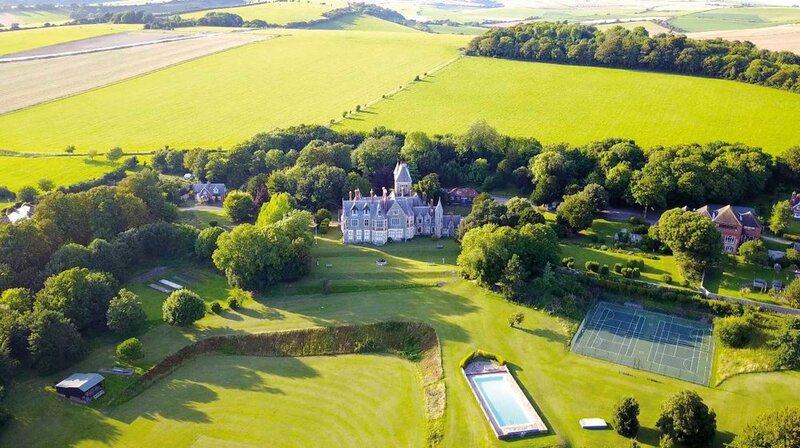 Its 30 acres of grounds form part of the landscape of the South Downs National Park. It is a family-owned school. Founded in 1921, the school has been helping children meet their full potential for almost a century. The school sits in a sweeping expanse of woodland and chalk grassland. The environment allows children to enjoy an outstanding education and a 'real' childhood. The 30 acres of grounds comprise a heated swimming pool, tennis courts, playing fields, woodland, wild areas, walled garden with play equipment for our Early Years children, Victorian greenhouses for gardening, and a managed wildlife pond. The pupil to teacher ratio is capped at 15 : 1. Staff know all the pupils so no child ever gets 'lost in a crowd'. Students perform strongly against national academic outcomes through a stimulating academic programme, focus on individual attention and innovative use of digital technologies. It also works hard on equipping children with 'social tools': developing confidence, self-belief and communication skills. Traditional values such as teamwork, respect and courtesy, we believe, will be as important for their future careers as their exam success. Life can be hectic for professional parents. The school is set up for the demands of the working day, with flexible free wrap-around care. For Pre-Prep pupils, it's from 8am-4.30pm. For Prep pupils, it's 7.30am-6pm. Ours is a homely school with a warm family feel and strong pastoral care. To find out for yourself, please contact us to arrange a visit. Sompting Abbotts' pupils get to know their catkins from cow parsley; their jackdaws from jays. They also get plenty of fresh air and exercise. Sompting Abbotts Preparatory School is a private school in West Sussex that's part of the 1,600km2 South Downs National Park. Staff and pupils use our extensive natural environment every day for sports, outdoor lessons and forest school activities. Parent Reviews of Sompting Abbotts Preparatory School. Parents explain why they chose the West Sussex independent school for their child's education. Sompting Abbotts' resemblance to the fictional Hogwarts School of Witchcraft and Wizardry is due to its Neo-Gothic style. The building dates from 1856. Classes in Defence against the Dark Arts are not part of the curriculum ... But pupils do enjoy spellbinding views of the coastline from Beachy Head to the Isle of Wight. Legend has it the school has a resident ghost: the Black Abbott. Learn more about the school history here. Sompting Abbotts Nursery is close to Worthing, Steyning and Hove. It accepts the 30 hours Free Entitlement for all eligible 2, 3 and 4 year olds. The Early Years nursery has some of the best outdoor play facilities in Sussex and all nursery children enjoy regular forest-school lessons in the woods and grounds. TV presenter and historian Richard Vobes visited the school to make a special two-part documentary for the Bald Explorer TV series. Here’s the first part of his film.